Yesterday's Eau Parfumée au Thé Vert is a very light fragrance, with minimal lasting power. In response to the demand for something stronger and longer lasting, Bvlgari introduced Eau Parfumée au Thé Vert Extreme, aka Green Tea Extreme, in 1996. Like the original, it was created by Jean Claude Ellena, and the notes are also the same: bergamot, orange blossom, cardamom, coriander, pepper, rose, jasmine, green tea, oakmoss, tonka bean, and beeswax. 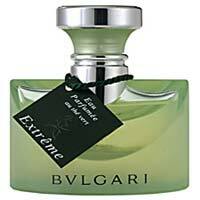 As you would expect, the Extreme is a deeper fragrance than the original. It starts with the same mix of citrus and spices, but the spices are heavier, and I find the pepper to be much more pronounced in relation to the cardamom and coriander. The dry down is not radically different except in that it hangs around long enough to be noticeable. The beeswax especially seems to have a more forceful presence, and the rose, which I hardly detect in the original, is now a bit more distinct. Despite that, it has less of a floral feel overall, and marginally less sweetness, and I would think that some women would find the Extreme to be the more masculine of the two variations. The Extreme is still clean and fresh; what is sacrificed is the bright clarity and crispness of the original Eau Parfumée. Which you prefer is largely a matter of personal taste. I like both, but I like the original better. You can find Eau Parfumée au Thé Vert Extreme most anywhere. At the online discounters, a 30 ml bottle is around $30. Coming on Sunday: Marlen on Acqua di Biella's new fragrance for men, Bursch. Next week, look for reviews of Bvlgari Eau Parfumée au Thé Blanc, Creative Universe Té, Sean John Unforgivable, and more. R, you nailed it! Not much difference in either one, and I have loved them both. You made want to re-visit this one. In fact, to re-visit all Bvlgari's Thé scents. Man, I should have tried this after reading your review. Now I know I'd like it. Then I didn't. ;D. I guess you hadn't programmed me in time. Those notes are among my very favorites! And I like JCE's stuff mostly a lot. Well, now that you've described it, I think I'd prefer the original version too, although its lasting power on me is laughably brief. It's a wonderful smell while it's there. R, you have a wonderful weekend too! It is great in summer though, when anything strong enough to last is just too strong. You know. In the humidity & all. Agree on all points! I liked it, but I prefer the original. The new version is more tenacious, but the wonderful balance is better executed in the cologne version. Today in TJ Maxx I saw Bvlgari's edp – beige box, couldn't see or smell it, it was taped shut. It was 30 bucks…but since I've never smelled it and am so picky, I didn't want to do a blind buy. They also had Shalimar Light EDT for 15., a bargain if you like it, and though I find it ok, I don't love it. So that's what I did so far today. I'm wearing Keiko Mecheri's A Fleur de Peau and it's yummmmmy. Depending on what size the Bvlgari was, that isn't necessarily a great price. Scentiments has 1 oz for $27. If it was the bigger bottle, not a bad price at all. Need to check out my own TJ Maxx, its been a while! I own a small bottle of the Extreme, and I really like it. It is funny, because I have had it a few years, and haev not worn it very often, but everytime I read something about it, I put it on and just REALLY like it. I have lots of scents that get ignored like that, poor things! R, I'm really interested to get either this or the original version. I have not smelt either but with my love for most of Ellena's creation and most tea scents I'm pretty sure this would be right up my alley I just can't decide on which one. Any help? I would really prefer greater lasting power but based on experience I usually prefer the lighter concentration than the extremes. If it were me, I'd go with the original and just get over the longevity issue — some things are not meant to last, LOL…and this is one of them. To me, the crispness of the original is sort of “the point”, you know? Hmmm..I know what you mean. I just dislike reapplying and specially having to carry bottles/decants in my bag but perhaps I will. Thanks! YOu know, I was looking at another site and this perfume was described as “Uplifting, long lasting, many sided, positive, calm and optimistic”. It's the scent worn by a friend's girlfriend, now wife. She's a Leo and I think that that description probably fits her to a tee. Now, I'm an Aquarian and I tried this at Neiman Marcus, kept it on for hours, and while I found it interesting and not offensive enough to wash off, it was so not me. Leos have big personalities and my friend says that she's a wonderful person, very caring, lots of friends, very social. Me, I'm drawn towards the Orientals woody,earthy especially. Wonder if astrology signs play any role in preferences. There's a book by John Oakes about perfume & astrology that you might find interesting, can't remember the name though. I like this perfume, but like January 13, I am an Aquarian and LOVE woody EARTHY SCENTS ! Coincidence ! WHat are your favorite woody, earthy scents for women ? – please share… my email is paula dot calendar at hotmail dot de THANKS ! Am I just paranoid, or did they recently change the “extreme” formula on this? I just bought a new bottle, and the other subtle floral notes seem overwhelmed by the tea now. Incidentally, I am a Leo too. Well, they've changed almost everything, so I don't know why not this one — but haven't tried a new bottle recently so I couldn't say.